In the event of a catastrophic storm that damages the roof of the home, one of the ways people can prevent water intrusion is to have what is called a Secondary Water Resistant (“SWR”) barrier. 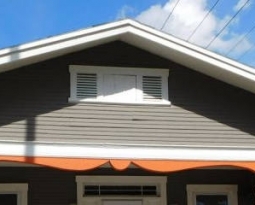 This serves as a barrier to prevent the water from entering the home even after the primary barrier (the roof covering system such as shingles or tiles and related underlayment) has failed. There are two important definitions of what qualifies as a SWR barrier in Florida. One definition is that which is found in the Florida Building Code, while the other is the definition that is written out on the windstorm inspection form issued by the Florida Office of Insurance Regulation (the OIR-B1-1802 form). 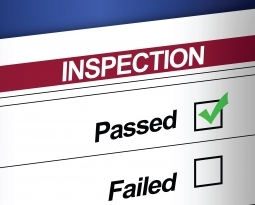 The building code will describe certain applications as being “SWR”, such as a hot-mopped roof in Miami-Dade or Broward, that do NOT meet the definition of SWR listed on the windstorm mitigation inspection form. This is an example of where the criteria to potentially obtain a discount on your insurance is above and beyond what is listed in the building code. As a result of these two definitions, there is often confusion among homeowners (and unfortunately many inspectors) as to what actually qualifies for the SWR discount. If you are wondering if you have it, we would be pleased to review any documentation you may have, such as a roofing contract (or a permit application packet), which details your current roof. In general, SWR barriers that are sufficient to obtain an insurance discount come at an additional cost and are often part of the discussion when you are replacing your roof. This is why they are often well documented “upgrades” in the paperwork that accompanies any properly-permitted roof replacement. In addition, because several of the valid options for obtaining the SWR credit are sandwiched in-between the roof covering and the roof deck, making them all but impossible to verify without documentation. Self-Adhering Polymer Modified-Bitumen Underlayment (“Peel & Stick” Sheets or Tape): Through this method, the roof decking is sealed using a self-adhering polymermodified-bitumen sheet, or tape. It is applied directly to the deck or sheathing joints.. Keep in mind that while the peel and stick products that qualify as SWR can also be installed on top of a layer of felt, only installations that are attached directly to the wood sheathing can qualify as SWR.It is thus possible to use the correct product, but install it on top of a layer of felt in a way that still does not obtain an insurance discount because it’s not directly attached to the sheathing. 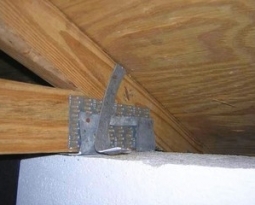 There is nothing wrong with this installation; it just does not qualify for an insurance discount. A good way to visualize this is to think of a piece of tape on top of a sheet of construction paper that is laying upon a wood table. If you pull up the tape, the paper comes with it, exposing the table. If the tape were instead attached directly to the table, the act of pulling up the construction paper on top would have no impact on the tape or the table at all. Closed-Cell Foam Adhesives: The other major category of Secondary Water Resistant Barriers are a particular class of sprayed foam adhesives that coat the inside (underside) of the roof deck inside the attic. These are sometimes applied only on all the joints and seams, while in other instances they are applied to the entire underside of all of the sheathing. This option is generally more expensive than the “Peel & Stick” options listed above, but can also be applied at any time, and not only when the roof is being replaced. These are NOT the typical foam insulation you find in many attics that are designed to save you money on your electric bill. Closed-Cell Foam Adhesives, such as Foam Seal and Insulstar Plus, are pricier products than simple insulation, and can be characterized by a very rigid structure and strong adherence to the roof deck. However, to the naked and untrained eye many types of insulation look similar. Thus, many people who initially think they may have an SWR product in their attic ultimately find they have traditional foam insulation. 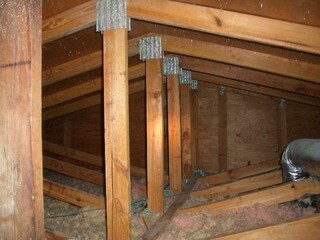 Foam insulation such as these products often obscures the Roof-To-Wall connections, such as the clips or straps that are holding down the roof. When these are completely hidden, it becomes much more difficult to substantiate their existence to obtain an insurance discount for the Roof-To-Wall Connection. 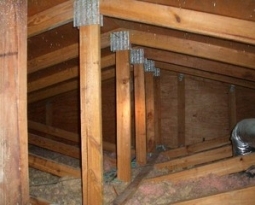 If you are considering foam insulation of any kind in your attic, make sure you have great photos of the existing roof-to-wall connections on both sides of several trusses or rafters before these things are buried behind fresh insulation. Real closed-cell foam adhesives have extraordinary uplift resistance. Studies have shown a 250-300% increase in uplift capacity. These products are so strong, in fact, that when they are substantiated they AUTOMATICALLY qualify the home for Level C Roof Deck Attachment. We have obtained the testing documentation for many closed-cell adhesive properties that ensure a Level C Roof Deck Attachment answer. As you evaluate whether or not to get a Secondary Water Resistant barrier as part of your new roof, or to get a closed-cell adhesive in your attic, safety and protection is not the only consideration. You will want to discuss the potential premium impact, if any, on your insurance policy. This discussion is only possible with your trusted insurance agent, and will help you figure out the financial cost and benefit of obtaining this discount after a Florida home insurance inspection. Feel free to take this article with you when you have that discussion.